The first map to show Kansas and Nebraska in full, including western parts. Map Showing the progress of the Public Surveys in Kansas and Nebraska. This is an impressive example of the 1863 public survey map of Kansas and Nebraska by Mark W. Delahay, Surveyor General of Kansas and Nebraska. It covers the region from the Missouri Rivers to the western boundary of Nebraska and from the Neobrarah (Niobrara) River to the Osage Indian Lands. In doing so it is the first map to fully illustrate either political entity (Wheat, 1086). 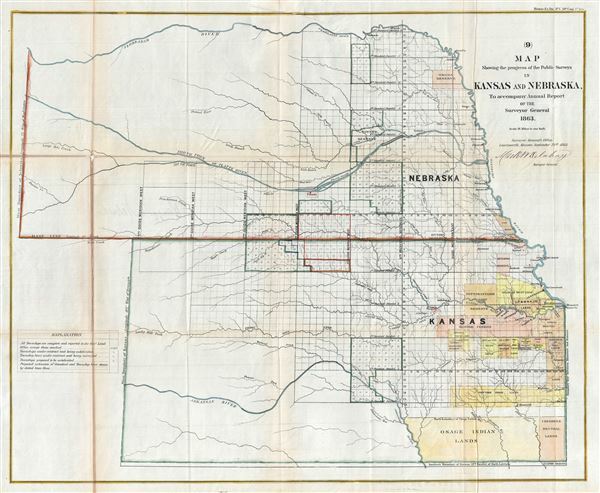 The map was prepared to illustrate the progress of the land survey work in Kansas and Nebraska, noted via a series of blocks representing the survey grid. An explanation near the left margin describes the various markings in the blocks. The map identifies various Indian lands and reservations, including those assigned to the Sac and Fox, the Pottawattamie, Delawares, Ottoe, Kickapoos, and others. Fort Leavenworth, the traditional starting point for most overland routes westward, as well as several villages, towns, cities and rivers are noted. This map was issued as part of the 1864 congressional report, Message of the President of the United States to the Two Houses of Congress at the Commencement of the First Session of the Thirty-Eighth Congress. Annual Report of the Surveyor General, 38th Congress, 1st Session, 1863 (Washington) 1864. Rumsey 1070.015 (1866 edition). Wheat, Carl Irving, Mapping of the Transmississippi West, 1540-1861, 1086.